March 27 2015— The 59th session of the Commission on the Status of Women (CSW59), which took place at the United Nations Headquarters in New York from March 9th-20th, focused on the 20th anniversary of the Fourth World Conference on Women and the adoption of the Beijing Declaration and Platform for Action (PfA). This year, the Commission carried out a review of progress in fulfilling its goals. The session gathered United Nations Member States and agencies as well as a great diversity of women’s and other civil society organizations from every region of the world. The activists and women’s organizations attending CSW aimed to ensure their voices were included in the discussions about the challenges faced in implementing the Platform for Action over the past 20 years, calling attention to the goals that were never reached and highlighting the most critical issues set out in the Beijing PfA that need to be prioritized from now on, including in the Post-2015 Development Agenda, which will be adopted in September of this year. 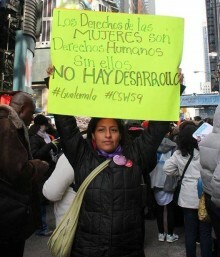 Among the activists and organizations at CSW, was Ingrid Galvez, 2005 GOJoven Fellow and a leader from GOJoven Guatemala, who was also representing GOJoven International. Ingrid has experience as a youth representative in the Regional Conference on Population and Development in Montevideo (2013), CPD47, and in the United Nations General Assembly Special Session (UNGASS) on ICPD+20 in 2014, spaces in which she promoted the sexual and reproductive health and rights (SRHR) of youth and adolescents in the process of ICPD +20. In this 59th session, Ingrid and other SRHR activists arrived with the objective of influencing decision makers to guarantee that women’s rights, including sexual and reproductive rights for women, youth, and adolescents, were treated as human rights and considered as a basis for development. The groups at CSW made themselves heard and affirmed that, after 20 years of work toward strengthening the Beijing Declaration and PfA and propelling its implementation, although progress has been made, there are still many challenges to address, which require increased commitment and scaling up the response to gender inequality and the violation of women’s and girls’ basic rights. The CSW Declaration drafted for the meeting was criticized for not reflecting the priorities of women’s groups, and for falling short of the level of commitment set out in the original Beijing Declaration and Platform for Action 20 years ago, therefore representing a significant setback. In solidarity with the allied organizations, another advocacy strategy used by the representatives of GOJoven International/GOJoven Guatemala and colleagues at the meeting was to consider how to influence the Sustainable Development Goals (SDGs) , which will be agreed on in the framework of the Post 2015 Development Agenda in September, as well as the process of the 48th session of the Commission on Population and Development (CPD) in April 2015. Additionally, Ingrid and allies in the region carried out actions and created spaces for dialogue with government delegates and the United Nations. Ingrid participated in many parallel events and met with Chancellor Carrera deform the Permanent Mission of Guatemala to the UN in New York, with Guatemala’s Official Delegation. She also joined civil society groups in the Global Women’s Caucus and in CSW CoNGO LAC meetings to define strategies for making joint demands. She also participated in activities prior to CSW, such as an advocacy training workshop by IWHC for young women, and the march for Gender Equality and Women’s Rights on March 8th, International Women’s Day. 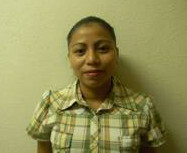 Ingrid did not leave CSW without making her voice heard, as well as that of thousands of youth from Guatemala and the region, when she was interviewed by various media outlets. Among them, Radio ONU (UN Radio in Spanish), which highlighted her voice and that of 4 young people from the region, who talked about what some of the pending topics in their countries are and why they are critical to the attainment of women’s rights. She was also interviewed by Mexico’s Cimac Noticias, where she denounced the criminalization of the human rights defenders and journalists. 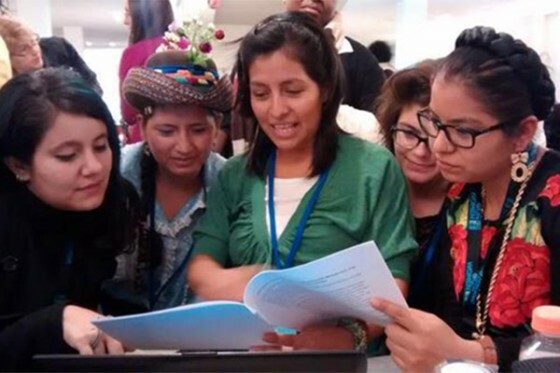 Through their participation in CSW59, GOJoven Guatemala and GOJoven International helped reach important goals, increasing their visibility and, above all, making known the reality lived by young people in Guatemala and the region.